Applicants are welcome from all the states in Nigeria. However, students must be able to reach our offices in Abuja or Lagos on a monthly basis during the program for full participation. Participants will work with our EducationUSA Advisors from June 2017 – August 2018 to try to secure places and financial assistance to begin study in the U.S. in August 2018. 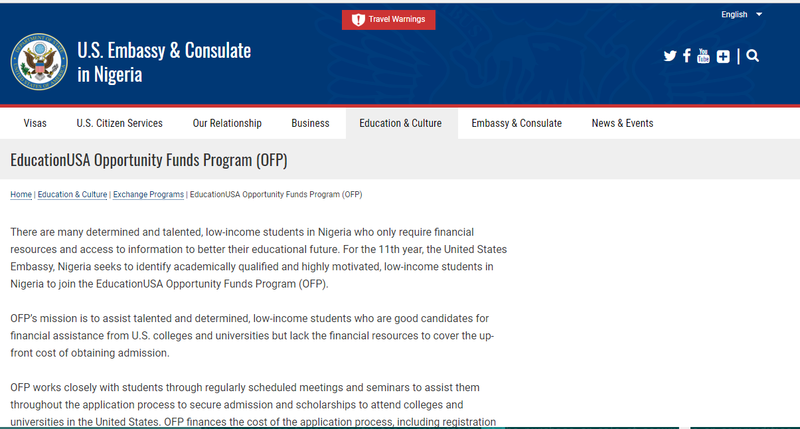 NOTE: ENTRANCE INTO THIS PROGRAM IS NO GUARANTEE OF A SCHOLARSHIP OR FINANCIAL ASSISTANCE TO STUDY IN THE U.S.
OFP is accepting applications from prospective undergraduates and graduate students. Complete Application FormJust send us an email at AbujaEducationusa@state.gov or LagosEducationusa@state.govrequesting an application form which is in PDF format. Fill out the document and send as an attachment to our email. Academic Results:Undergraduate Applicants– Attach a copy of your WAEC “O” Level results (from WAEC website). Include Cambridge A’Level or IGSCE results if applicable or available. Graduate Applicants– Attach a copy of your Final year results and degree results (if available) First Class only (STEM majors preferred). Letters of recommendation:Undergraduate Applicants: Request a teacher or your school principal to complete a letter of recommendation form, attesting to your character, talent and skills. Please do not include a basic testimonial that does not talk about you as an individual. Graduate Applicants: Provide the details of a lecturer, professor, or Head of Department (HOD) that we can contact to find out more about you. Transcript:Undergraduate Applicants: Send a scanned copy of your transcript from JS1 to SS3 including your mock and first term results, if possible. Graduate Applicants– Send a scanned copy of your transcripts that show a GPA of 4.5 or above on a 5.0 scale. The Stocks I am Invested In And Why.